BOOK BO AND DUSTY TODAY! Hi, we're Bo and Dusty! 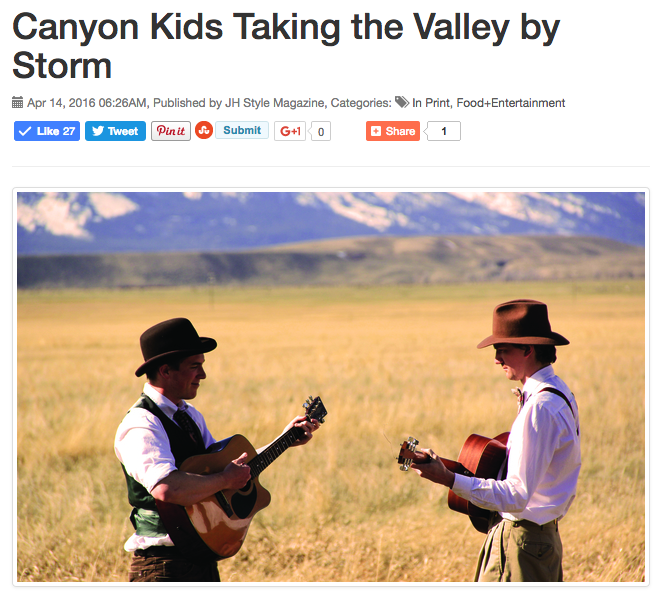 "The band Canyon Kids was born in the Snake River Canyon. Bo Elledge and Dusty Nichols were rafting company photographers with some free time on their hands when they weren’t snapping shots of rafters headed downstream. “We ended up spending a lot of time down in that canyon together, and we’d often bring our guitars and do songwriting down there,” Nichols explains. They soon dubbed their collaboration Canyon Kids. Their second album, Best Loved Poems of the American People, began streaming online in the fall and their full release came out this February. But the project was a year in the making. They crafted their music at the Teton Artlab where they were able to take their time and record on a relaxed schedule. “This was a much more spaced-out and relaxing way to record,” Nichols says, comparing it to the hectic pace of working with a producer."